Imaging that we have a field for Country and a field for Province. 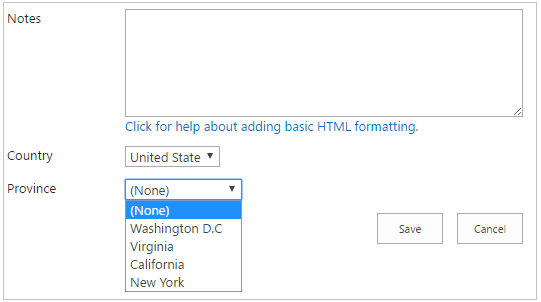 Each country has many provinces and when we select a country, only provinces belong to that country can be available to show in the dropdown list. To prepare the data to input the value, I create 3 lists: Country, Province and Customers. For province list, I create a lookup field named “Country” to look-up to Country list. I also create a lookup field named Country and a lookup field named Province for Customers. 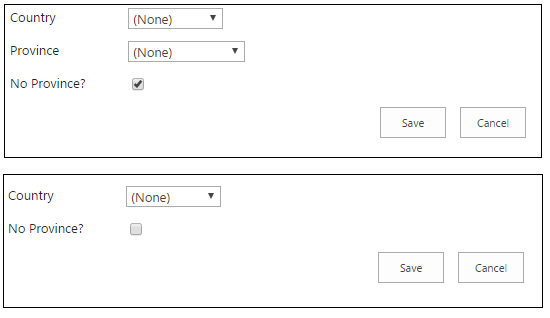 The requirement is to create new customer, in the dropdown of Province, it shows only the province of following selected country. Just think about the situation when we need to show or hide a control when we do action on another control. In this example, I just implement to show or hide control when we check for the field. It’s very simple and similar to the case 2nd. Instead of hidden control, this case just do disable or enable another control in the form. Okay, from my friends, I always think about the easiest way to deploy the solution or easy to use. Sometime, there are some limitations when we do customize the page layout, css, html or even of coding by using JSOM. However, let try your best in implementing to match the requirement as much as possible. HBX.ActionType is a type of cascading. There are 3 values upon to 3 cases above, that is Cascading, Display and Active. This code must be applied to both the NewForm and EditForm, but I just show the way to deploy on the NewForm. Click Add a web part. In the web part galleries, select the ScriptEditor web part from Media & Content category. In some cases, you can customize the code depend on your situation and update the code. I love to use js to implement anything on SharePoint and restrain to use the farm solution with the backend code to implement your feature. With me, as simple as possible!